We’d love your help. 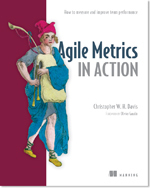 Let us know what’s wrong with this preview of Agile Metrics in Action by Christopher W.H. Davis. Agile Metrics in Action teaches The iterative nature of agile development is perfect for experience-based, continuous improvement. Tracking systems, test and build tools, source control, continuous integration, and other built-in parts of a project lifecycle throw off a wealth of data you can use to improve your products, processes, and teams. The question is, how to do it? Agile Metrics in Action teaches you how. This practical book is a rich resource for an agile team that aims to use metrics to objectively measure performance. You'll learn how to gather the data that really count, along with how to effectively analyze and act upon the results. Along the way, you'll discover techniques all team members can use for better individual accountability and team performance. To ask other readers questions about Agile Metrics in Action, please sign up. A clear disappointment, this is what the book is to me. I can tell you that. I was expecting something about how to assess the agile values, mindset or practices into qualitatives or quantitative measures. Instead I have a writing about a framework developed by the author to measure and control (yes !) the development cycle. Even the mindset behind this is questionnable about being agile. Good advice for agile teams on how to effectively use metrics to on process optimization and improvement. This book presents many methods and metrics you can use to monitor a project or product and gives examples that show how the metrics can be used to improve your work process. However, I think I preferred Manning's "software development metrics" which was more detailed. I highly recommend this book to managers at all levels. A great introductory into the world of Agile management and metrics. It can be helpful for all team-members, regardless of their role in the team - of course, first and foremost for team managers, but also for developers and executives. And if you just have started adopting Agile approach, this book can serve you as a decent starter. If you are looking into practical insights on how to measure Agile practices progress and take action when needed this is the book to read. I thoroughly enjoyed the whole book and will keep it as reference during day to day work. It was a decent introduction to tools to quantify team productivity using agile processes, but credibility was lost when affect and effect were used incorrectly. Variety of examples, well-captured content and nicely structured book. I found several good ideas from several chapters that I will be applying directly in delivery teams context.